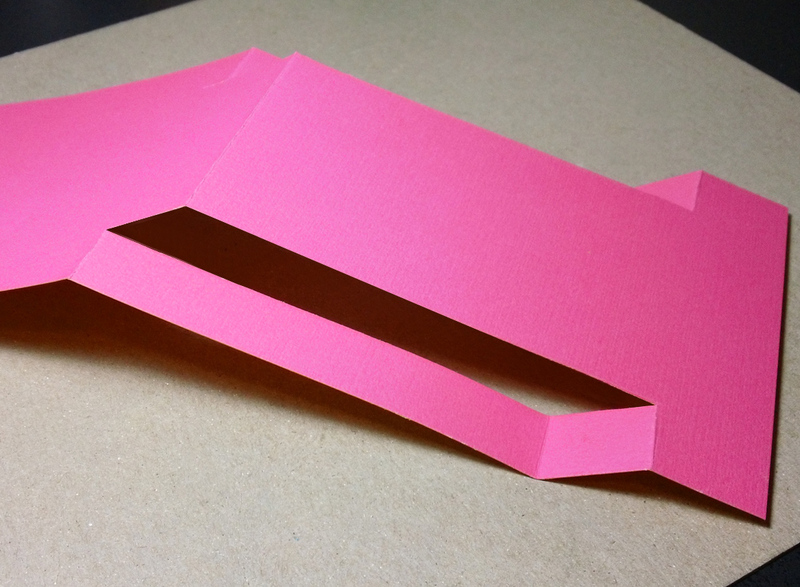 Wow, the response to the last tutorial for Sandy’s Funky Fold card was amazing! Weren’t those funky cards fun? 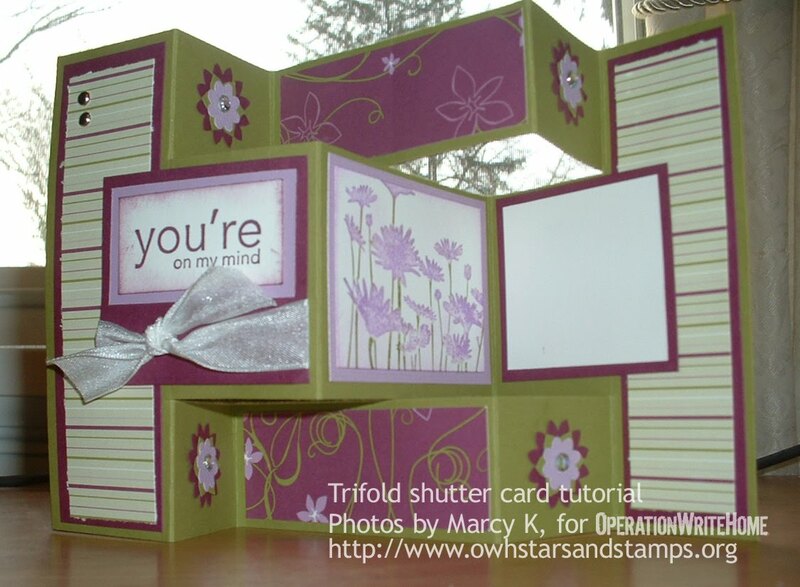 Let’s keep the ball rolling with those differently-shaped cards with this fun tutoral by Jodi. 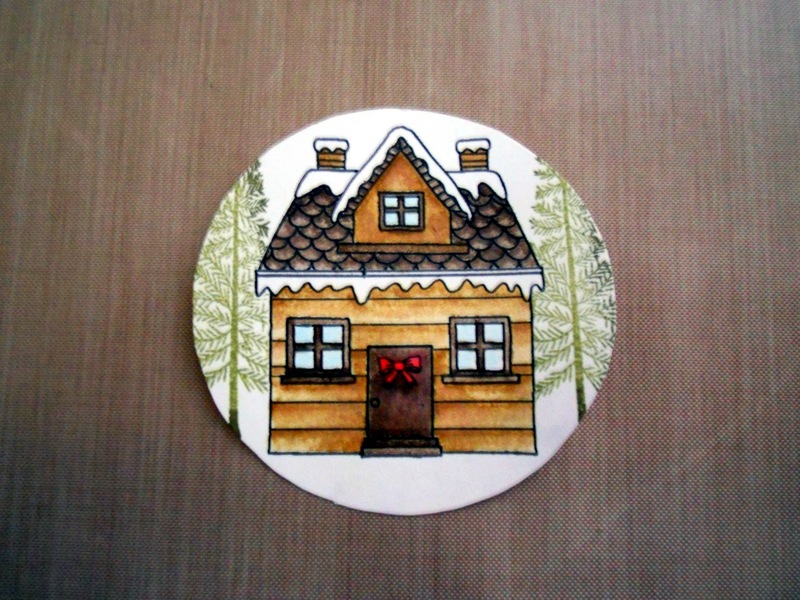 Her cute coffee cup card is just too irresistable in this cold weather that I know a lot of us are still experiencing! 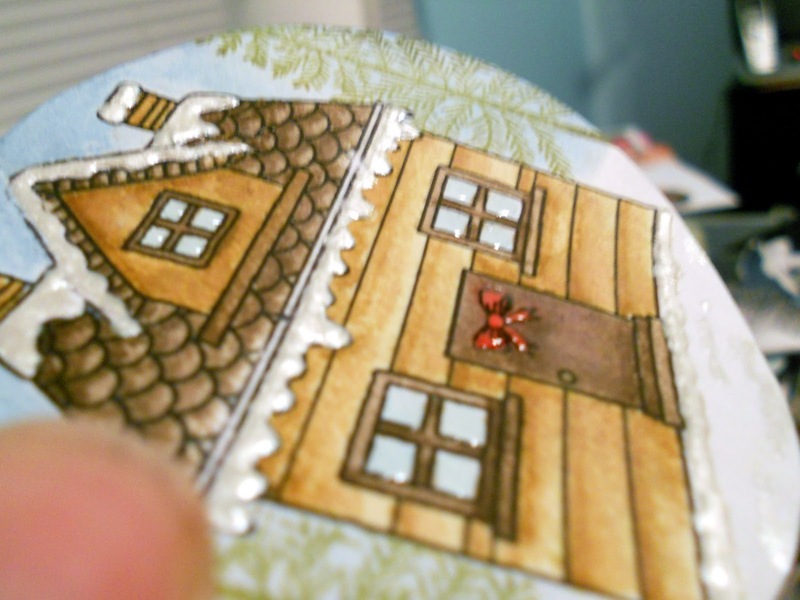 My favorite part about this card is the little lip print at the top… it looks just like my coffee cup every morning! 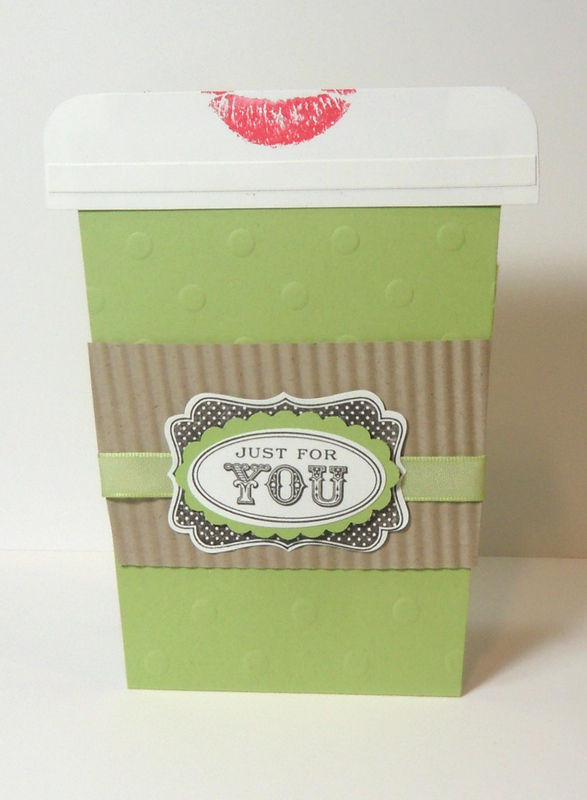 Jodi used all Stampin’ Up! products to make this card but I know that you guys will figure out ways to make this card with your own alternates if you like. Also, let’s see who can come up with the cutest coffee sentiment for their card??? Or, think outside the box, and make this cup for tea or cocoa! Here’s the tutorial. Now go, make, and share! 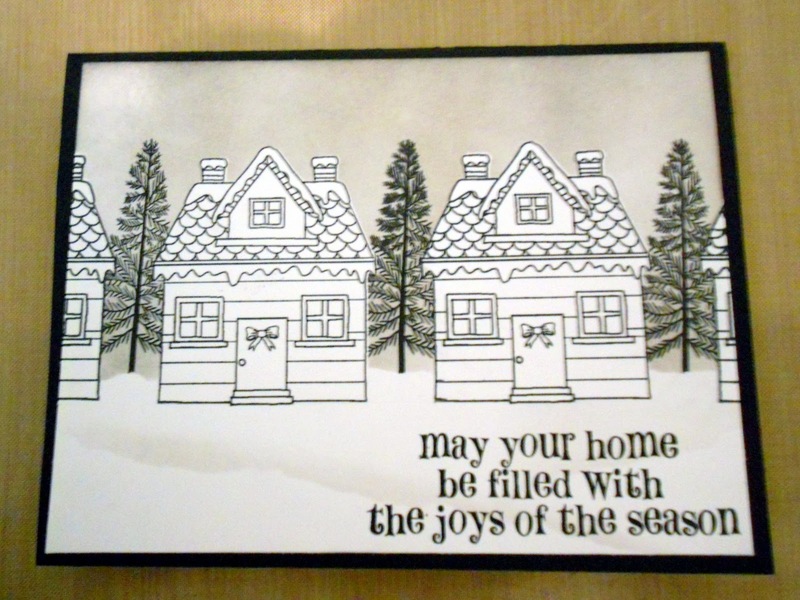 -Nancy K.
You will also need 4″ of ribbon, and whatever bits you want to make your sentiment. 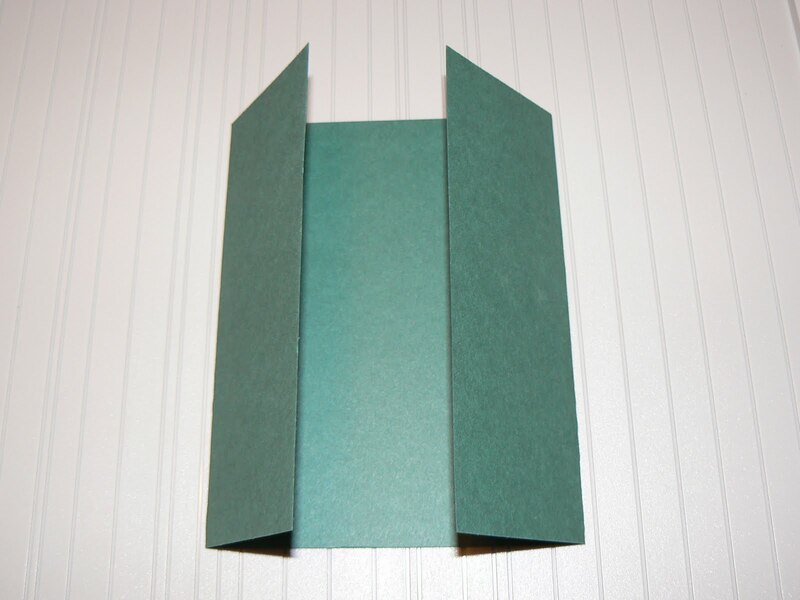 The green card stock is folded in half to make the base of the card. 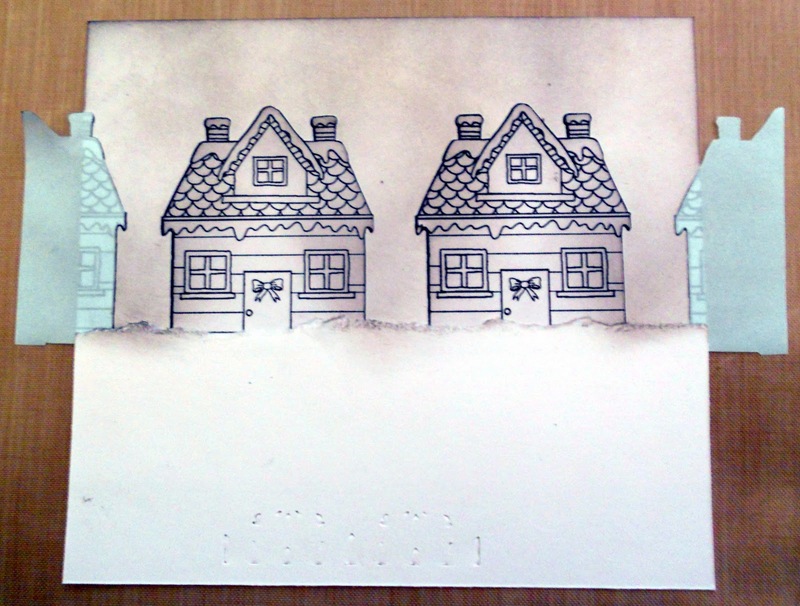 The front of the card is run through a diecut machine with an embossing folder of your choice. 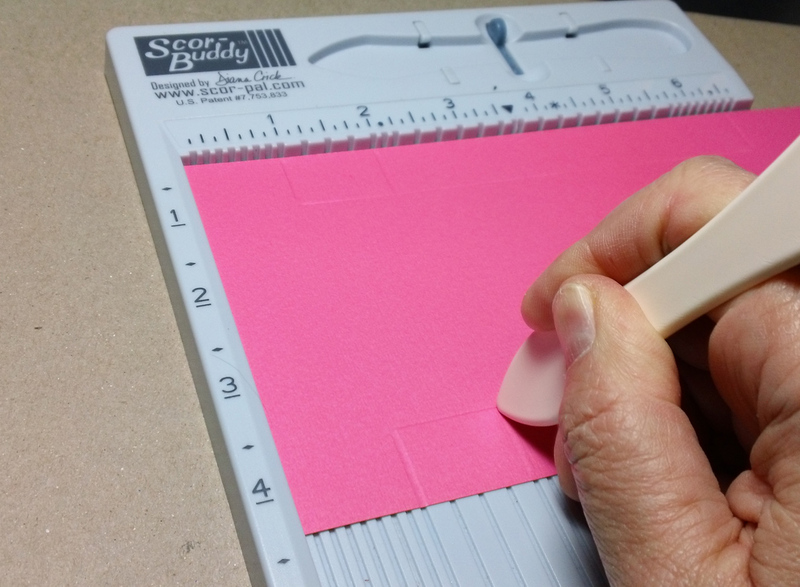 At this time, cut a strip from each side diagonally, making the \_/ shape of the cup. 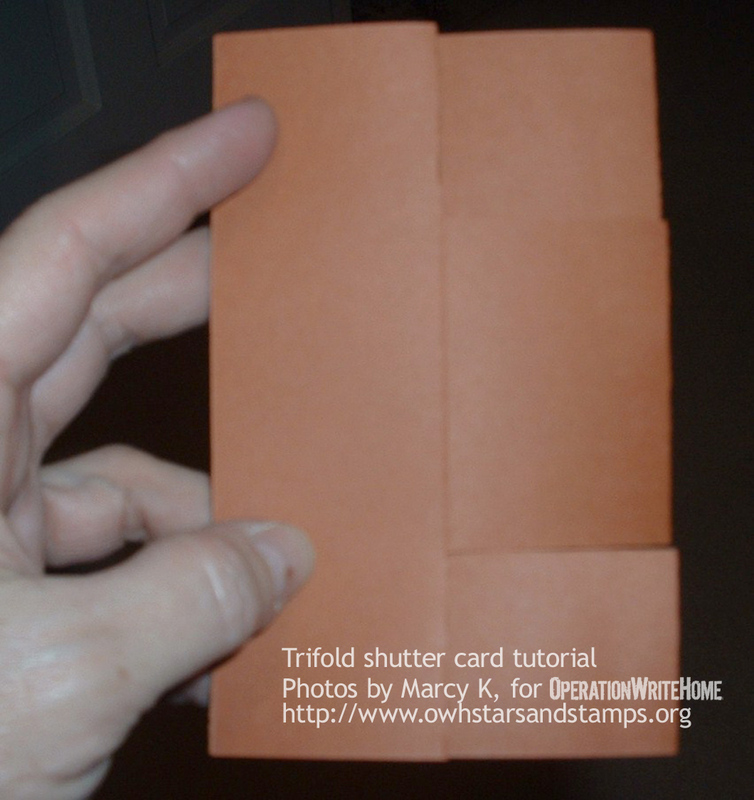 Using red-line tape or choice of glue, glue the inside edges of the card shut and set aside. For the band on the cup, use the crumb cake cardstock and run it through a crimper. 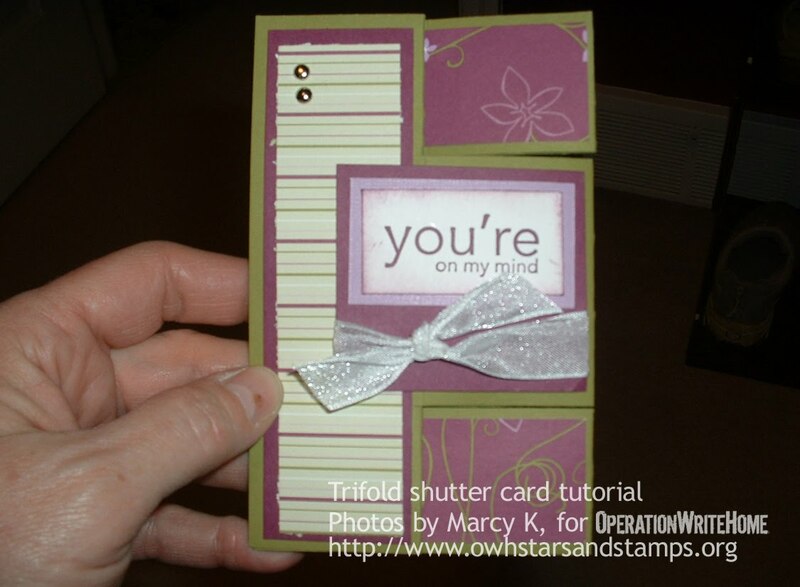 Trim it to fit the green part of the card and adhere. Stamp the sentiment and punch or cut out if a punch is not available. The ribbon goes around the crumb cake band and the label is mounted over it using dimensional adhesive. Thank you, Jodi, for the awesome tutorial! Jodi doesn’t have a blog, so please… leave her some love in the comments, and be sure to share your cup cards here! This Grandfather Clock is one of the class cards that was taught yesterday aboard the Navigator of the Seas…and you can pretend you’re on board with us by making a card with this cute fold! It’s not one invented by OWH, but sure is darling. 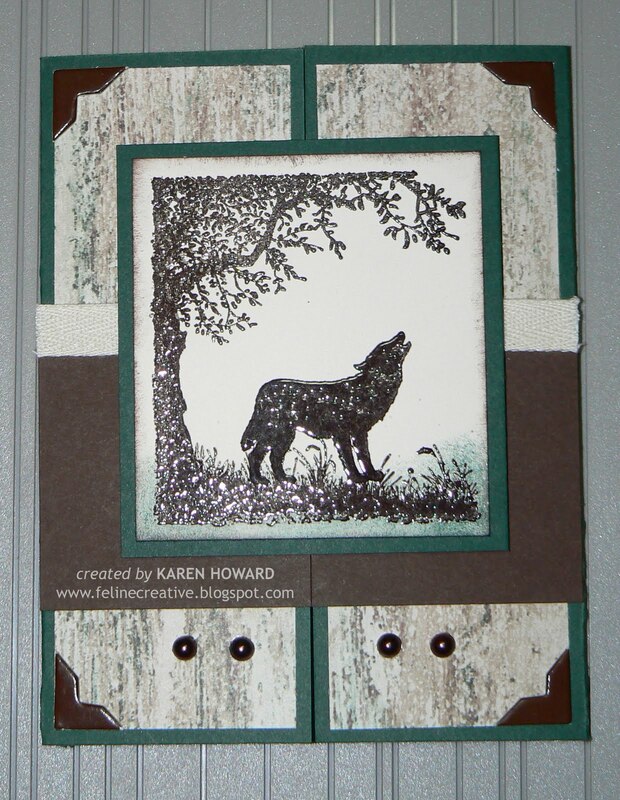 The video shows this card, made with the Hero Arts/OWH All the Time stamp set and papers in the Studio Calico kits that the class participants received. 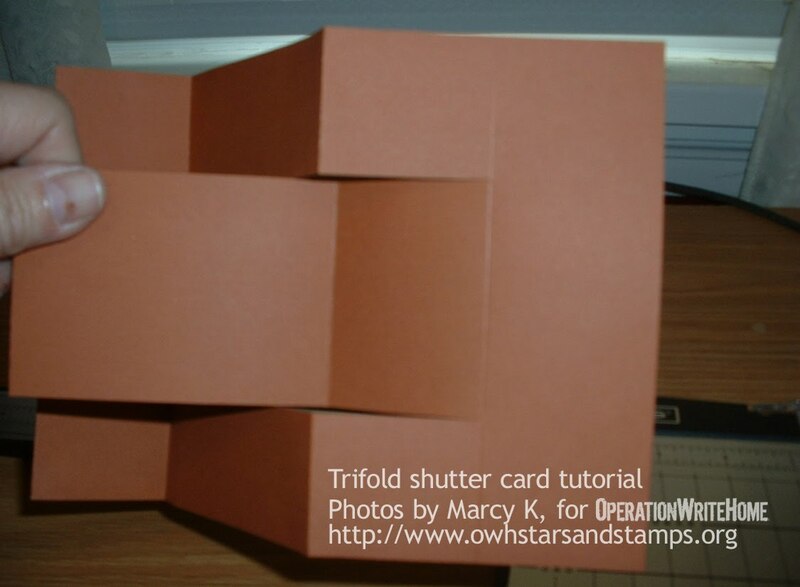 The video shows this particular card – and the still photos below show another card made with this fold. 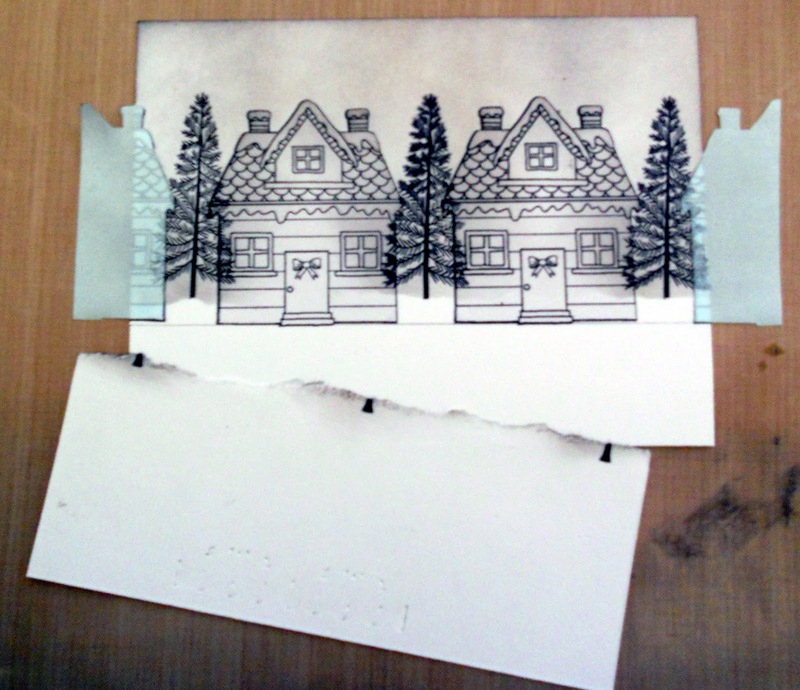 Thin side panels: 1/2 inch x 4-1/4 inches, or if you want to completely cover the card base, 3/4 inches x 4-1/2. 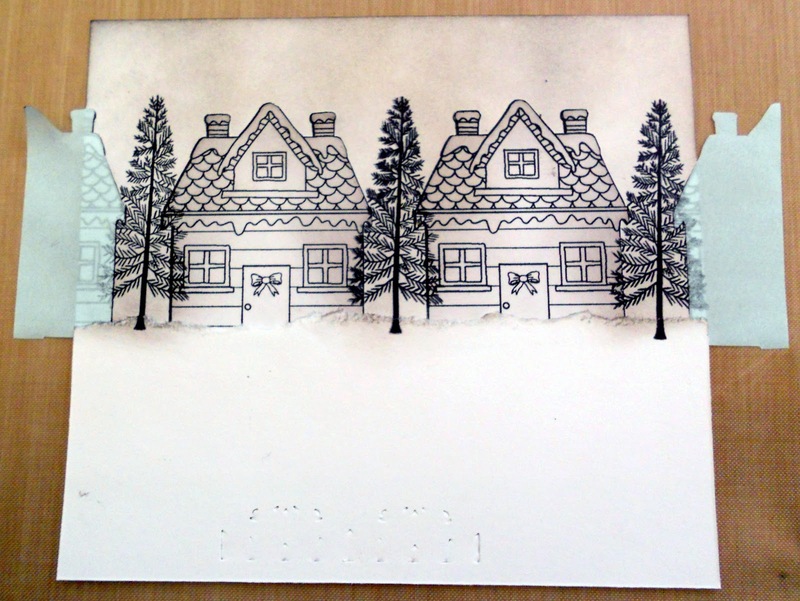 Center panel: 2-1/2 x 4-1/4, or if you want to completely cover the card base, 2-3/4 x 4-1/2 inches. The card base for this second card has one pink and one yellow side – so you can see more easily what’s going on, I hope! 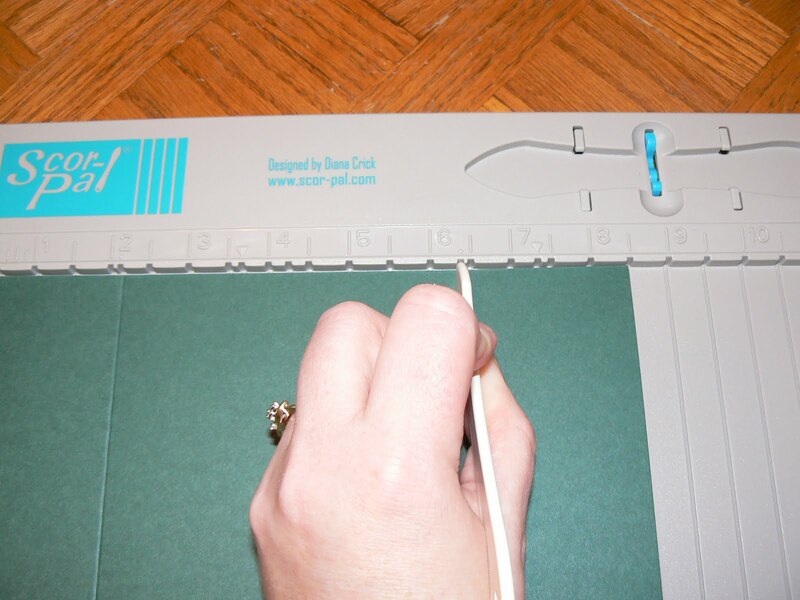 Crease the scores well with bone folder. Then decorate! Decorated with yellow ribbon and paper from the Studio Calico kits, image from The Greeting Farm, and other leftover bits of paper and ribbon. Hope you give it a try! Note that these cards tuck ALL the way into your envelopes, they don’t hang out the front. We’re going to shake things up with this week’s tutorial, thanks to Penny! You can see more of her work if you visit her blog – Penny’s Page. 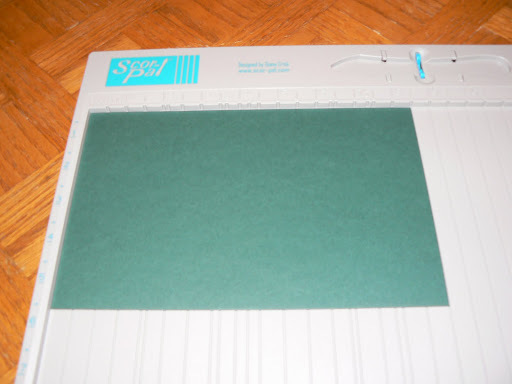 What you will need: an A2 card base, patterned paper, a die or punch, closely woven tulle, score tape and filling. I used Theresa Collins paper and Nellie’s Dies. 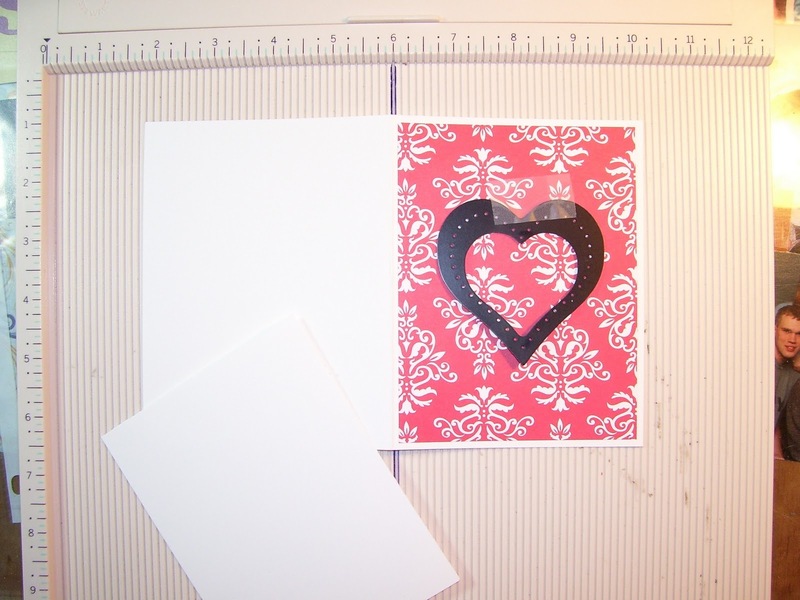 Adhere patterned paper to front of card and decide on placement of opening. I taped my die down to prevent it slipping. With the inside of your card facing up adhere one end of the tulle to the card front. I used my ATG for this step. Add your choice of filling (small beads for me) and fold the tulle over. At this point you will want to use score tape or other adhesive on the tulle getting as close to the edge of the design as possible. Don’t worry about about the stickiness, it will be covered. I apologize for the bad picture, but you can see the score tape around the heart. 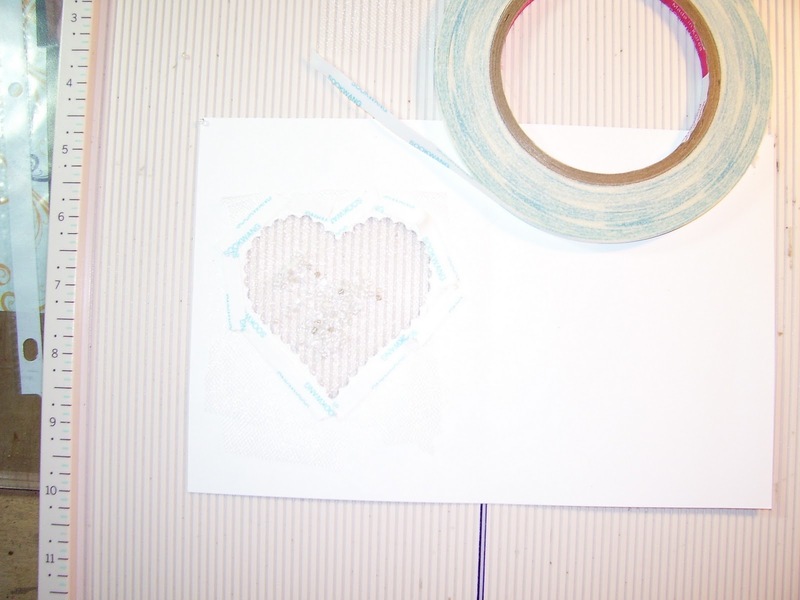 Adhere your piece of cardstock, matching the shapes together over the tulle hiding the messy bit. Take the reserved heart die cut (patterned paper) and adhere to the inside of the card again matching the shapes together. At this point, you can embellish/finish your card as you choose. 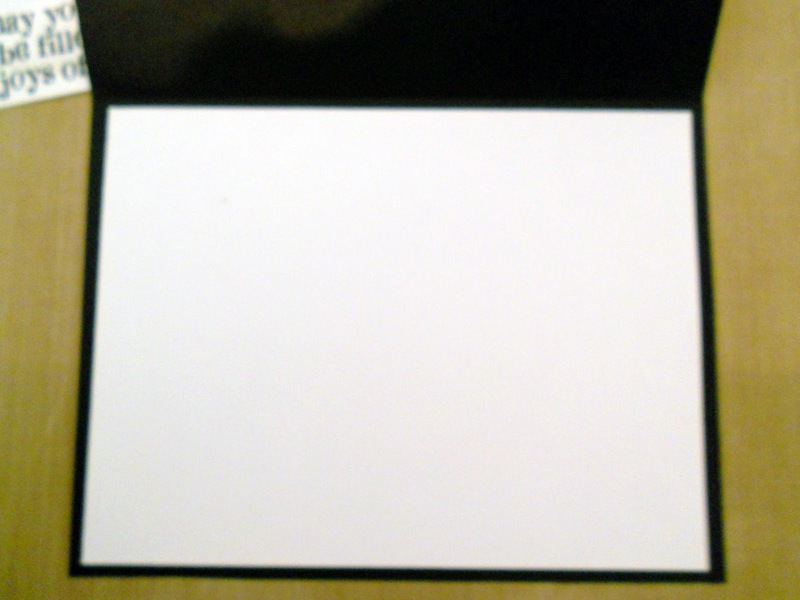 I chose to make frames for the opening on both sides of the card front. I also added the swans to the patterned paper heart. 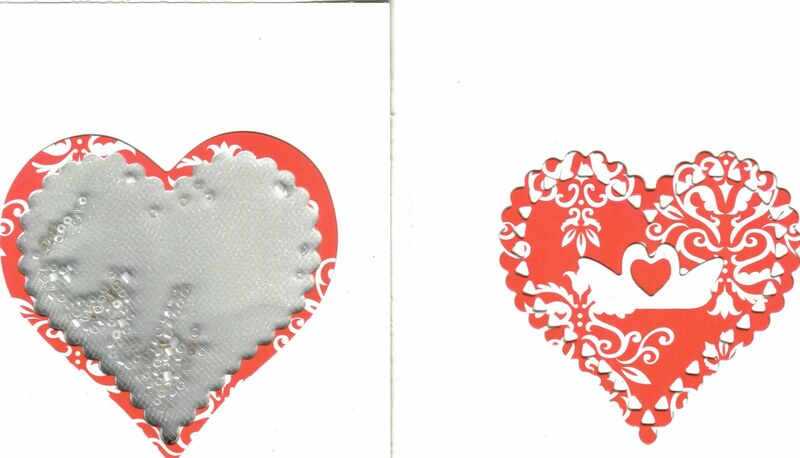 I stamped “love you” on a small white heart and pop dotted it to the front of the card. 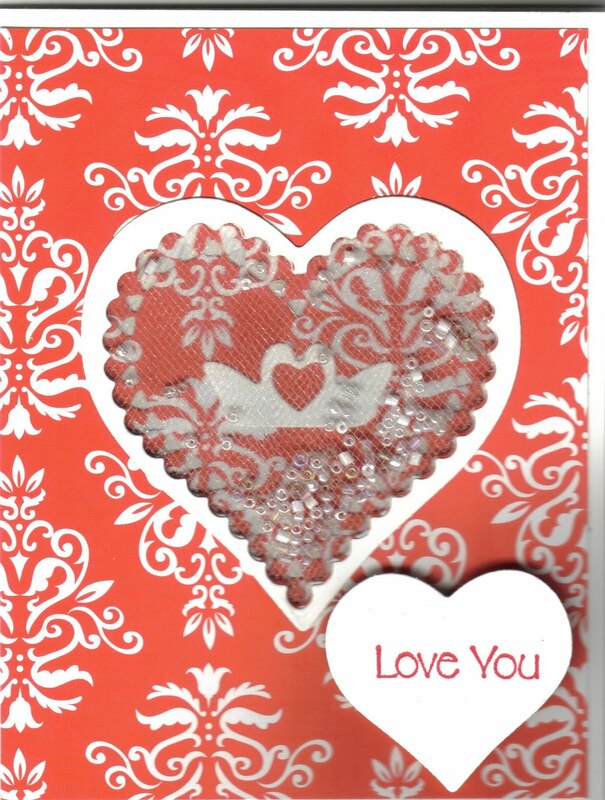 When the card is closed the patterned paper heart shows through the tulle. I hope this tutorial will help you to make great cards! Thanks, Penny! I’ve seen these shaker cards and never given them a try. Let’s all try it this week and be sure and add a linky below. This week’s tutorial was submitted by Kelly. Be sure and visit her website; there’s a whole lot of beautiful happening over there. 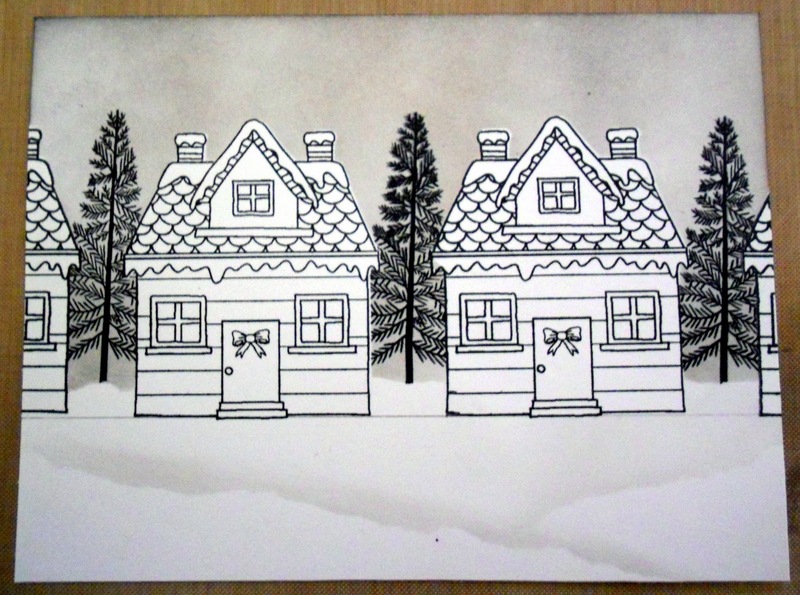 I do want to remind everyone that the deadline for Christmas cards has passed, but this tutorial was too good to pass up. Enjoy! So if you have seen any of my other cards you know I really dig the masking. I used Hero Arts Sending Holiday Cheer set for this card. 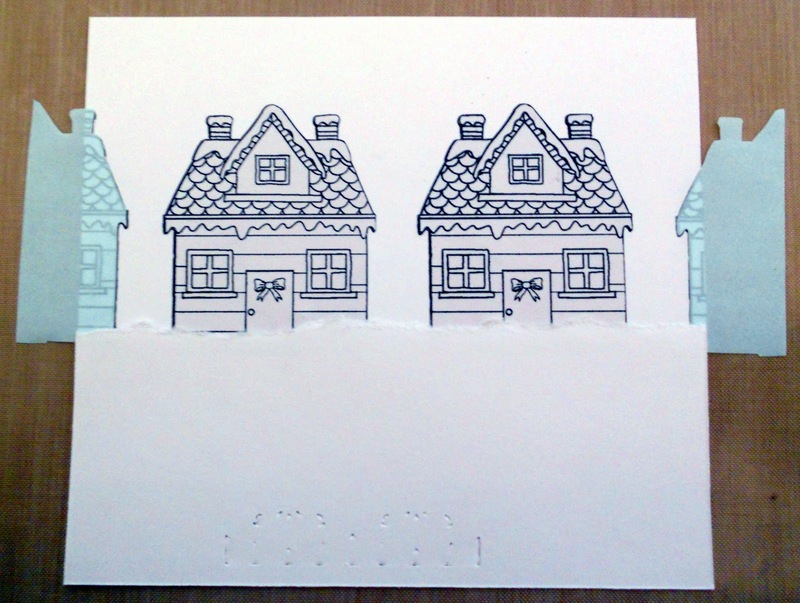 To start stamp the house twice on inkadinkado’s masking paper and cut them out. 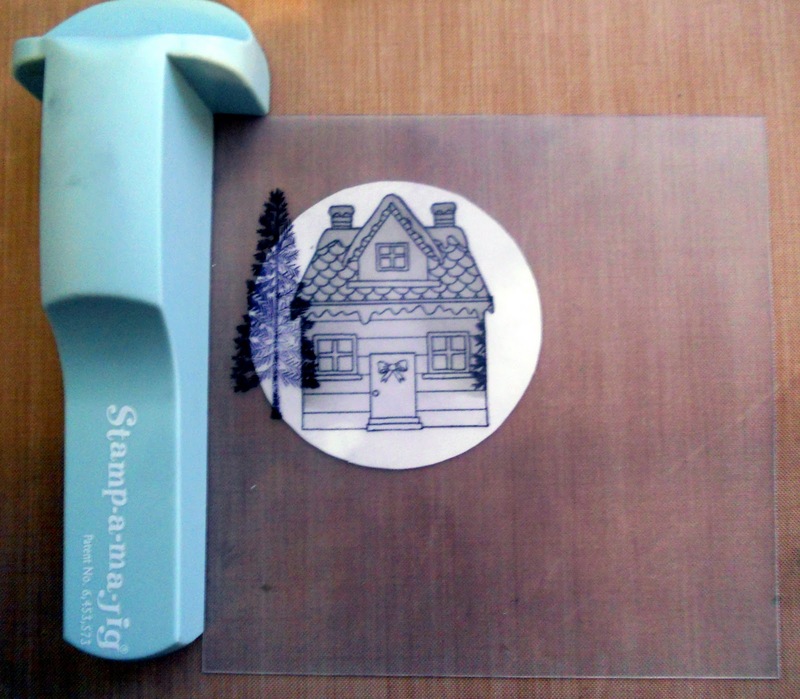 Then stamp the house 4 times on white card stock. In order to make sure they are straight I use a ruler to draw a line and erase it after I’m done. Put your masks over your stamped houses. 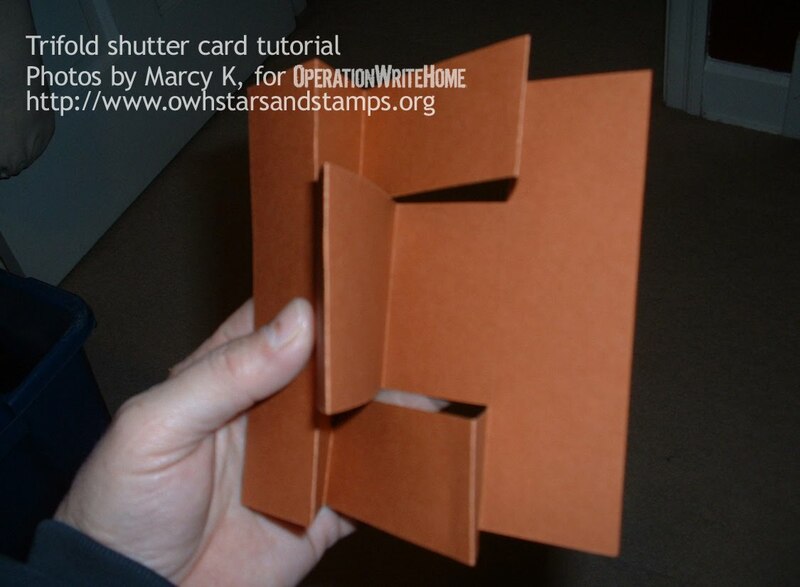 Rip a scrap piece of card stock or post it note and lay it down to mask for your snow line. Rub on black soot distress ink to color your sky. Since I didn’t want a black sky I just used the ink that was left on my sponge from previous uses. If you don’t have ink left over you can dab your foam on the pad once or twice and then blot off some of the color on a scrap. 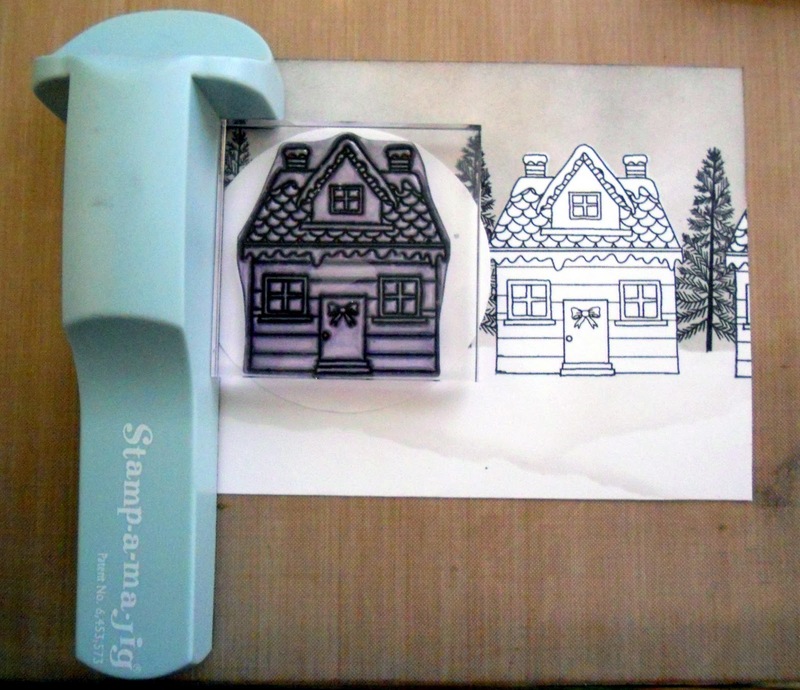 Stamp the tree three times in between the houses. Remove the mask for the horizon line. Use the mask to create little hills by putting it down on an angle and sponging on the very edge. I did this twice just to create some interest in all that white space. 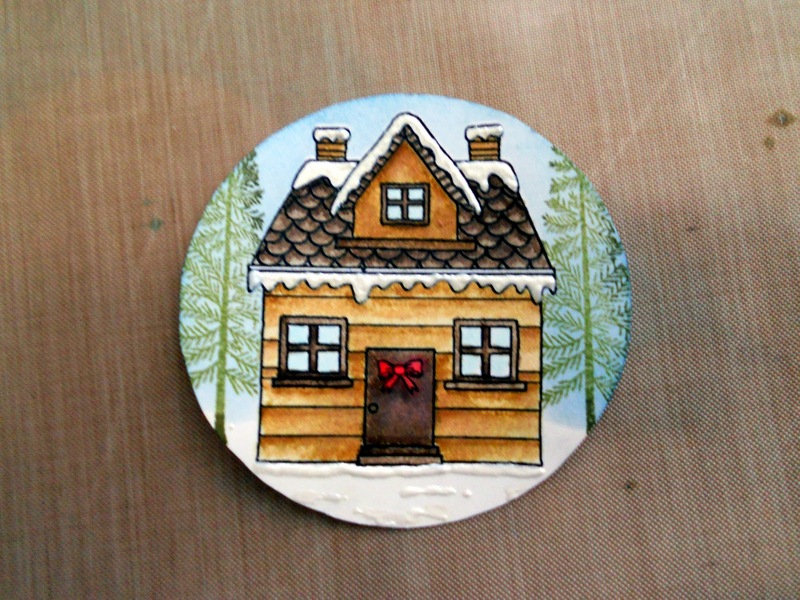 For my stamp lighting I wanted a circle but none of my dies or stencils had the right size, but you know what did? That’s right. 🙂 another reason why Dunkin Donuts is awesome!! 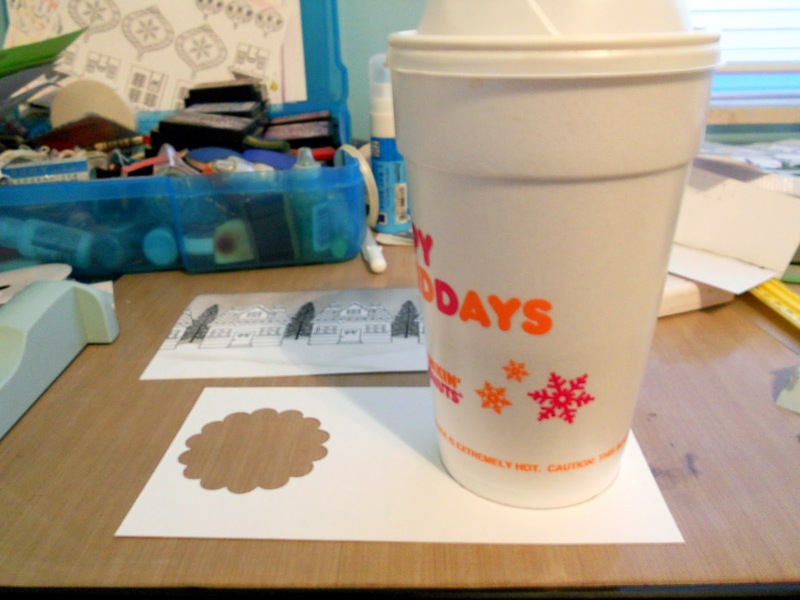 So I traced my coffee cup and cut out my circle. Obviously if you have a punch it’s okay to go ahead and use that ;)Now it’s time for the stampamajig. 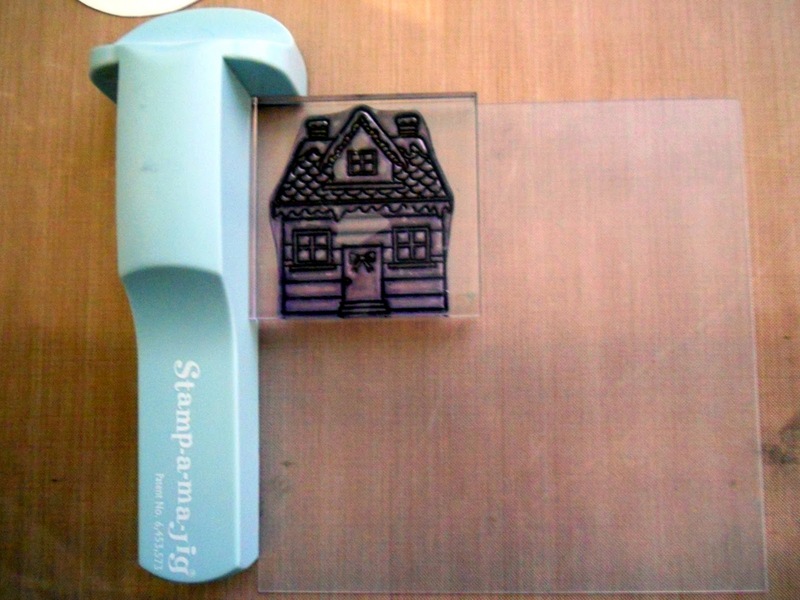 Stamp the house on the clear plastic. Make sure you get right into the corner with your block. Take the plastic and line it up with the house on the background. Without moving the stampamajig, move the plastic and lay down your circle. In order to get the placement right I rock my stampamajig up a little that way it’s position doesn’t change and I can move my circle around. You also have to make sure your background doesn’t move while your adjusting. It’s a little tricky the first or second time but you figure it out lol. I put my plastic back down to double check the placement. Move plastic and stamp the house onto the circle. again making sure to get the block right in the corner. Now that your house is stamped mask it again. I try to make sure I use the same one I did the first time. This way it is easier to match up my trees. 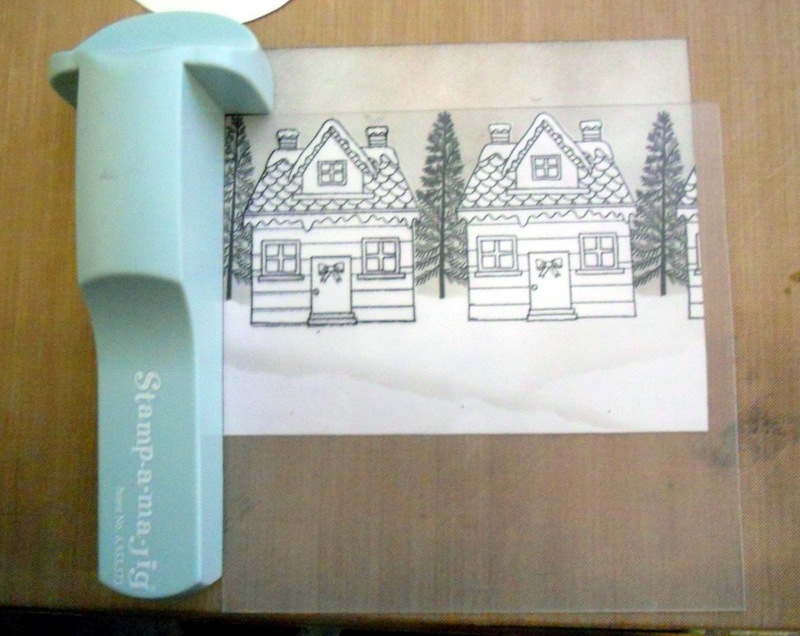 Stamp the tree on the plastic and line it up just like you did the house. Make sure you remove the background this time. Stamp a tree on each side using peeled paint and forest moss. Remove mask and color in your house. 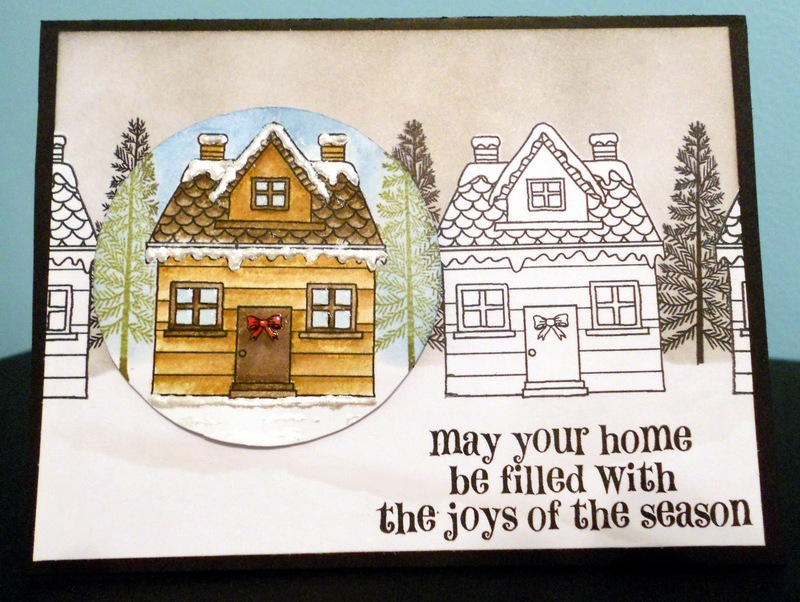 I colored with distress inks: brushed corduroy, walnut stain, barn door, and tumbled glass. Put your mask back on (yes I could of done this step before I colored but I was too excited to color he he) and line up your snow line mask. Rub on faded jeans distress ink, remove mask. Add liquid pearls to the snowy parts of the house. ﻿Normally I would use glitter but that’s a big no-no for OWH. We don’t want to endanger our soldiers! Add some glossy accents to the windows and bow. While that is drying we go back to the background panel and stamp our sentiment. Mount the panel to a black card base. Here is the final card again. Thanks again to Kelly for today’s tutorial. Please leave a comment and let her know what you think. 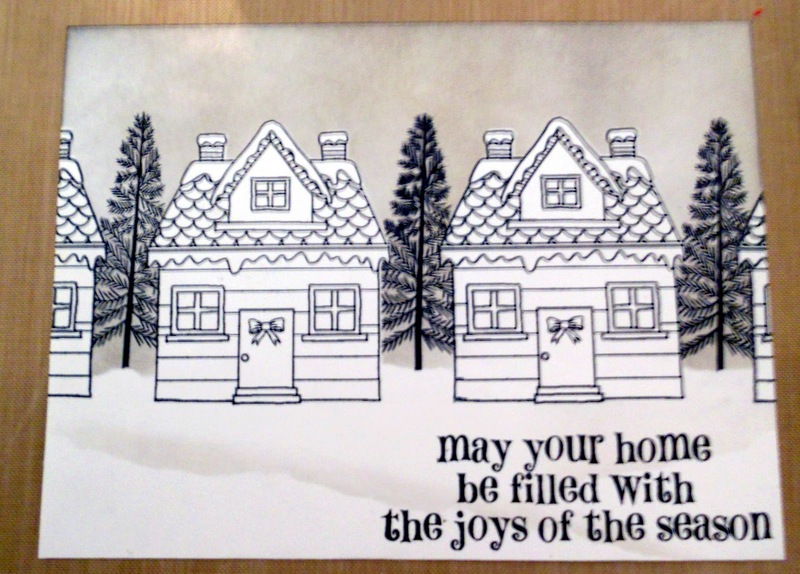 And remember, YOU can also submit a Tuesday Tutorial by emailing kate@operationwritehome.org. If you haven’t visited Darlene’s blog over at It’s an Inkin’ Stampede, you are missing some great posts. This week’s technique is so beautiful I immediately wanted to feature it here. Darlene had already made the video, but for any of you who are unable to view it, I have captured some images and added brief instructions. 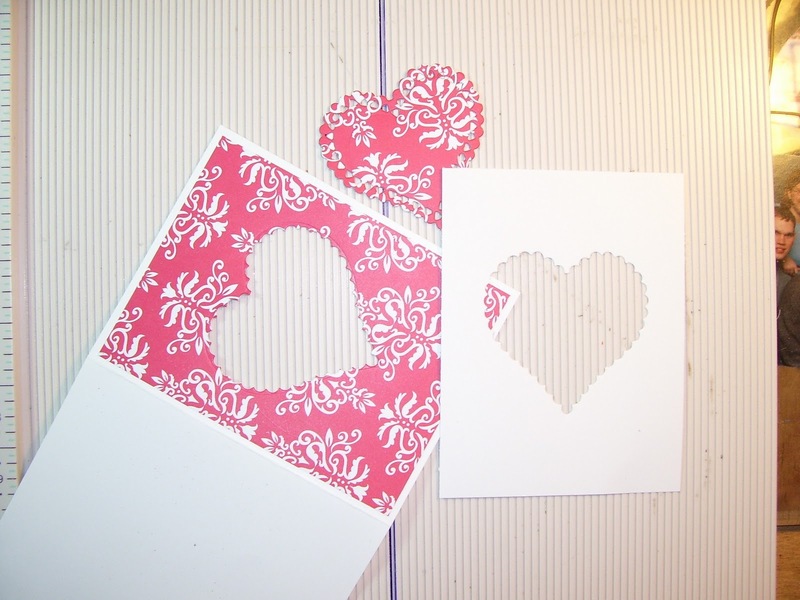 Start with a circle of cardstock with a hole punched in the center. Darlene used a 1-3/8″ circle. 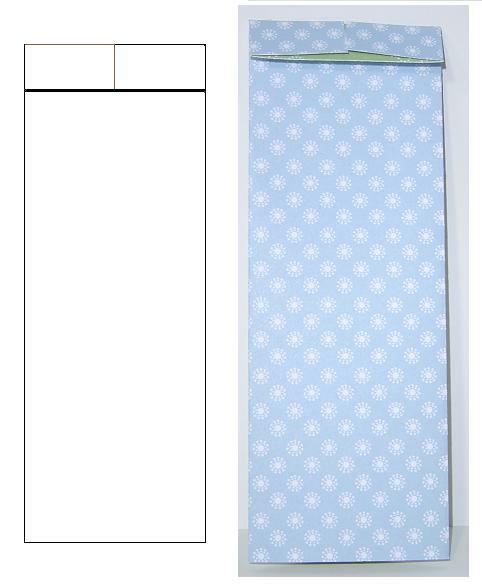 You will also need two and a half cardstock butterflies. 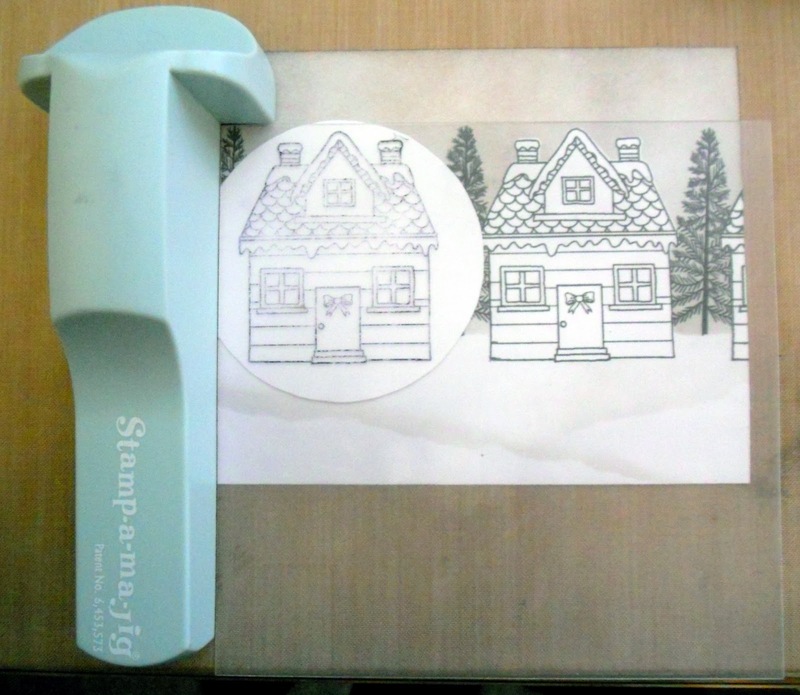 She is using a punch sold by Stampin’ Up! Divide the butterflies into halves, and trim two of the halves to make the two small side petals as shown. You can see from the arrangement there are two upper petals, two small side petals and one lower petal. Use a sponge to add color to the inside edges of the petals. For the pictured petals, Darlene has added blue and purple ink. Neatness and uniformity aren’t necessary. Every flower has its own individual flair. 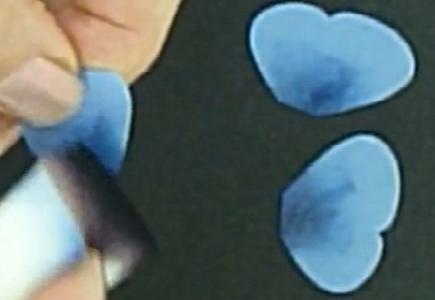 The video shows an option of adding glitter to the top two petals. I have omitted that step here, because we don’t use glitter at OWH, for the safety of our heroes. Place a small piece of sticky strip or similar adhesive on the inside center edge of the back of each petal. After placing the first of the top two petals, place the second so that it overlaps the first by half. Then add the two small side petals. Notice in the picture you can see they are slightly curved. Add the bottom petal and pinch or fluff the petals until they look the way you want them. Add the veins using the fine point end of a black marker. Finish with a yellow brad for the center. If you want to try this technique and you don’t have a butterfly punch, be sure and visit the blog hop this weekend. I’ll be giving away butterflies as blog candy on my blog hop post! Visit Darlene’s blog or leave a comment and let us know what you thought about today’s tutorial. Also, if you have an idea for a tutorial, or would like to demonstrate a technique, please write us at challenges@operationwritehome.org. Thanks again, Darlene for sharing this technique with us! 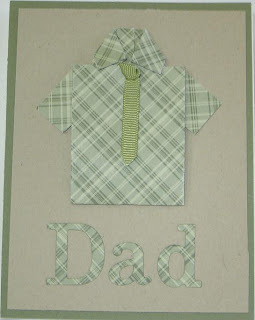 We are coming up on the deadline for Father’s Day cards; remember, Father’s Day cards should be in the hands of the shipper by May 15 (sooner is better). 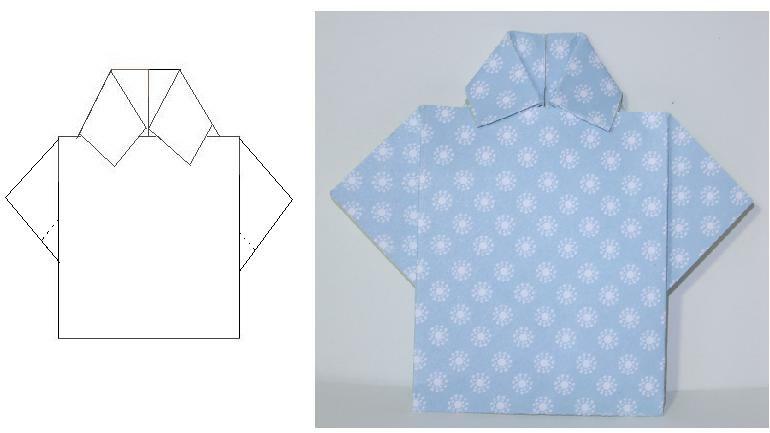 While looking for ideas for dads, I’d seen these cute little shirts, so I went in search of instructions on how to make them. There are a lot of instructions out there, some easier to understand than others. Hopefully you will find these easy to follow. Remember you can click on any picture to enlarge it. Start with a 4″ x 6″ piece of paper. 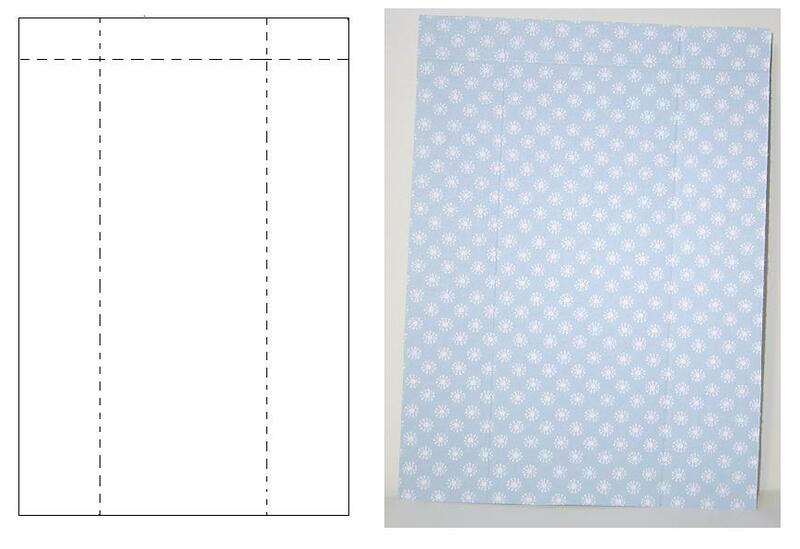 Choose as thin a piece of paper as possible for ease of folding. 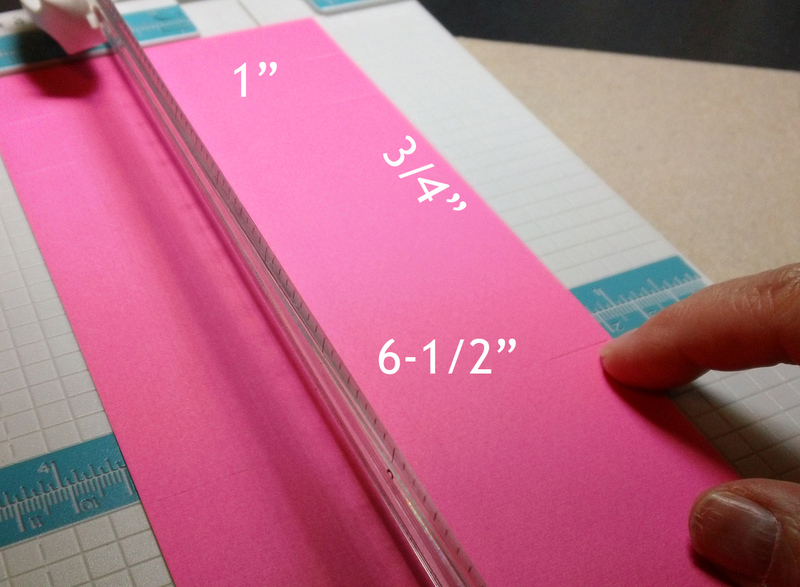 Score lines 1″ from either side of the paper and 1/2″ from one end as shown. Fold along the two long score lines, so that the edges meet in the middle. 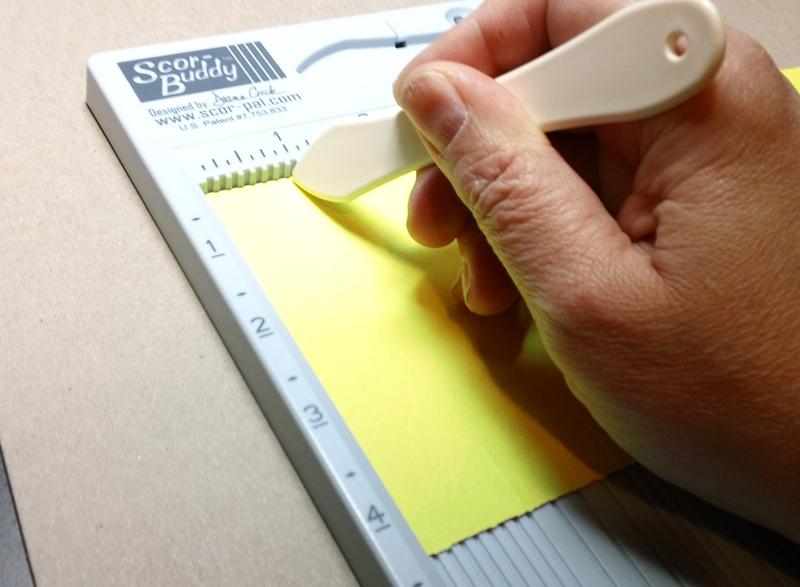 Turn the paper over, and fold the 1/2″ edge toward the solid side. 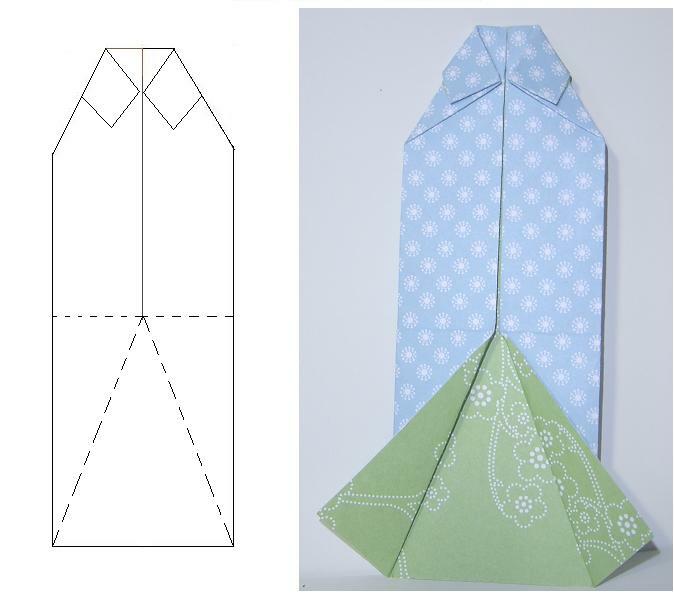 Turn it back over to the split side, and fold the top corners in so they meet at the center line. You are forming the collar of your shirt. 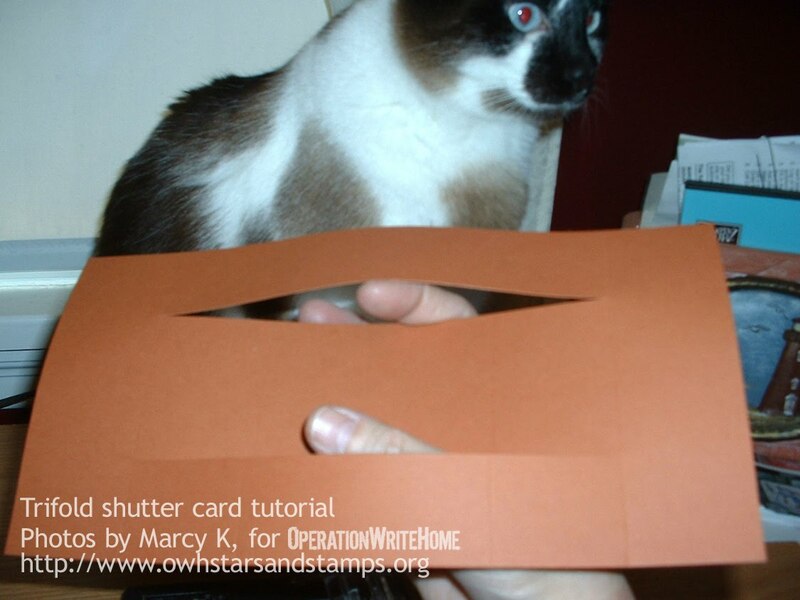 Bring the bottom of the paper up and tuck it under the flaps of the collar. 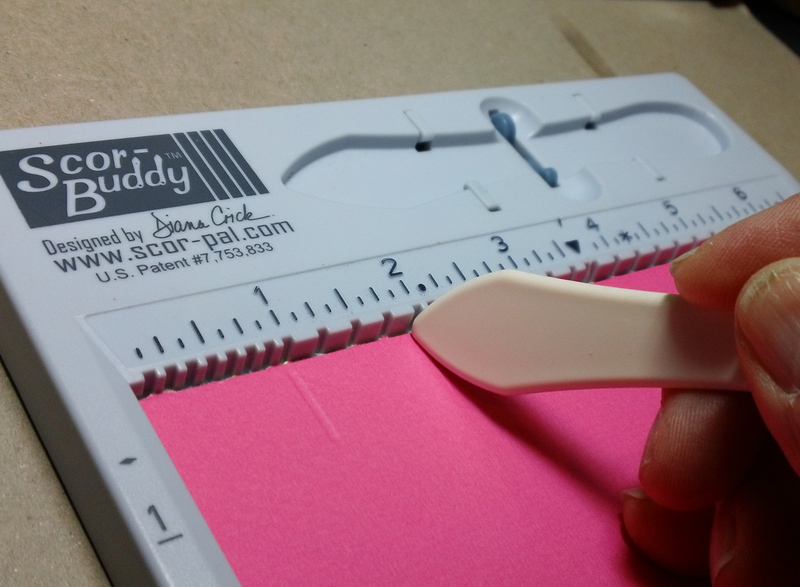 Use a bone folder to make a hard crease at the fold you have created. 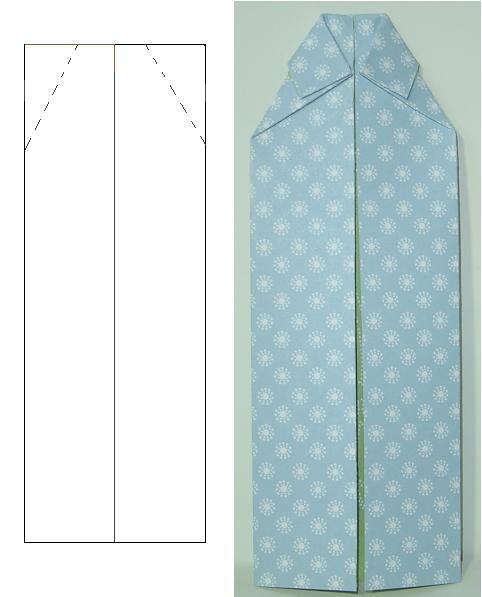 Fold the paper back up and tuck the bottom under the collar. Here is your shirt. You may want to trim the sleeves so that they are narrower and look more natural. Add brads for buttons, or a knotted piece of ribbon for a tie. Here is the best video tutorial I found. It’s hard to see what she’s doing, but her instructions are really clear, and she’s explaining from a card making, rather than origami, perspective. 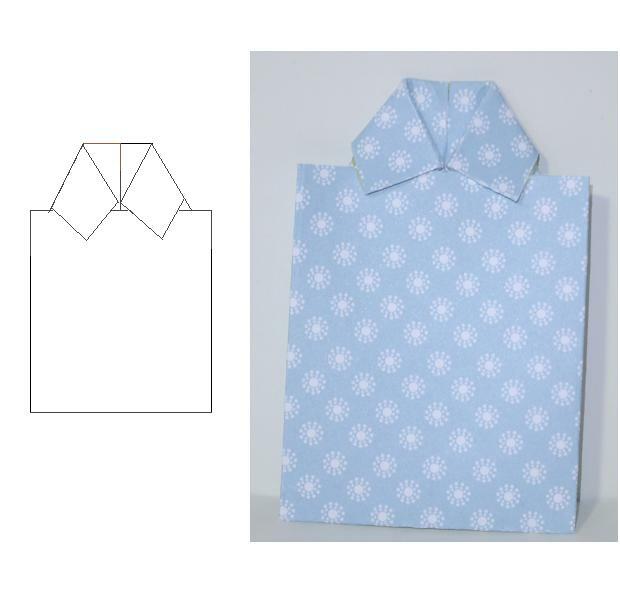 Please leave a comment with a link if you use this tutorial to make a shirt card. Please also let us know what subjects you would like to see in a future tutorial, or email challenges@operationwritehome.org if you would like to share a tutorial with everyone. 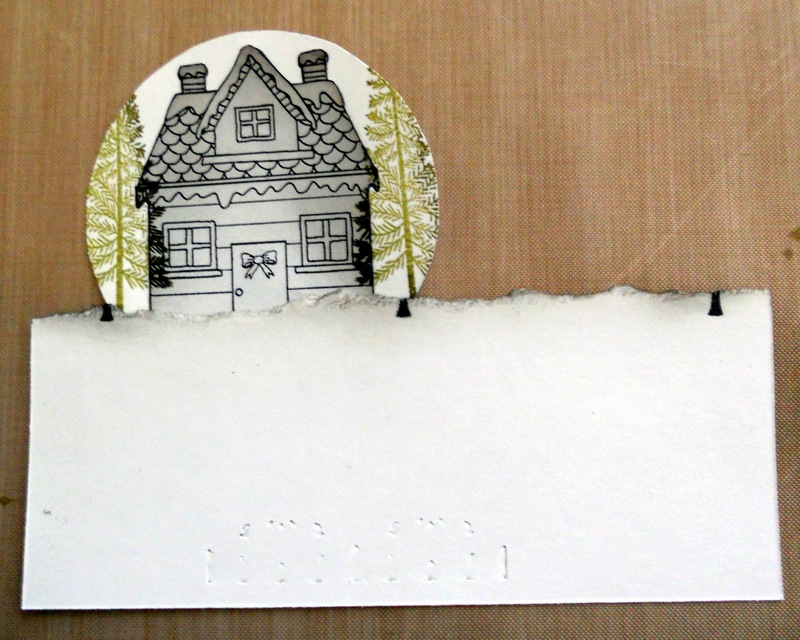 Fancy fold cards are fun to make but often the instructions don’t come to fit the standard A2 size card we all know and love to make for Operation Write Home. 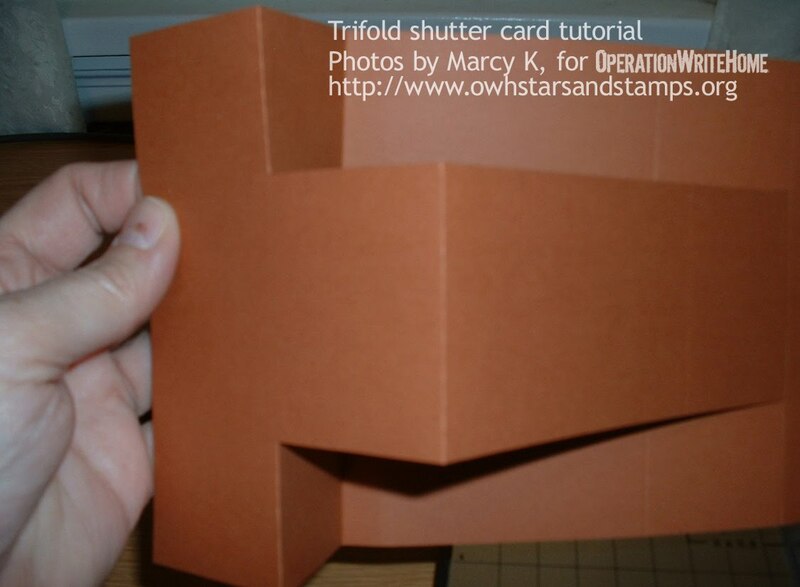 Today we have a fun fancy fold card tutorial for you prepared by Karen Howard. 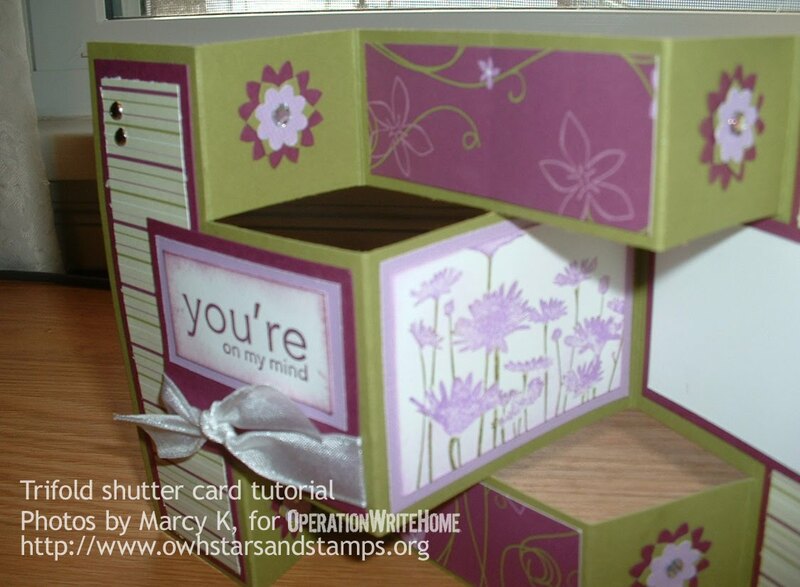 Thank you, Karen, for the awesome tutorial and sample card. 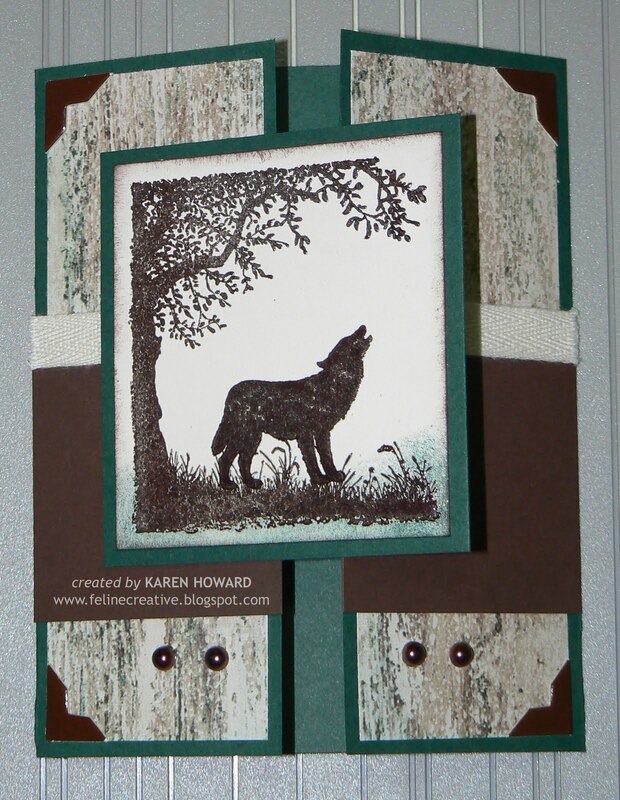 To see more of Karen’s beautiful card creations, please visit her blog, Feline Creative, and show her your appreciation for today’s tutorial and sample card. I recently ordered the Scor-Pal to make some fancy fold cards and to my delight, found instructions on the packaging for some standard A2 sized cards. 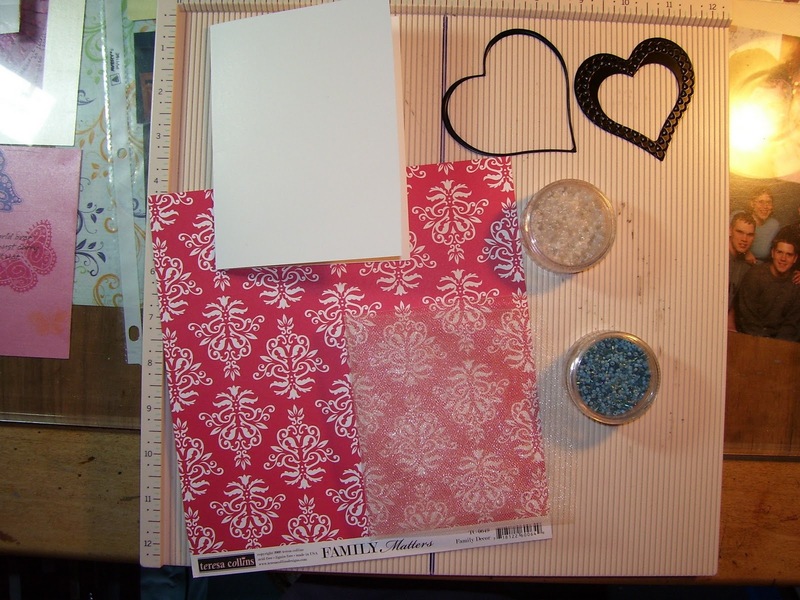 So I thought I’d start with an easy one, the Gate Fold Card, and make this fun tutorial to share with all of you! 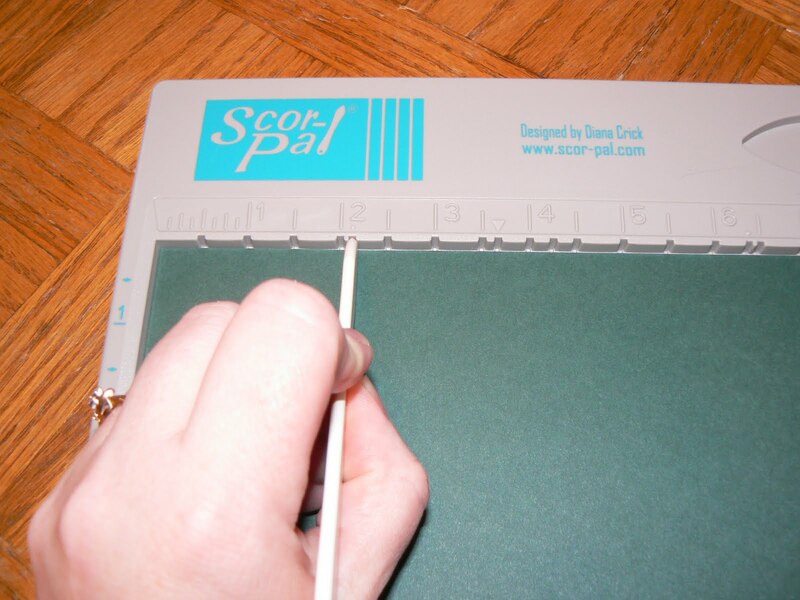 The instructions and photos for this tutorial show the Scor-Pal but keep in mind that you may also use your portable trimmer for this as well. Simply swap out the cutting blade (orange colored blade) for the scoring blade (black colored blade) and you are ready to go! 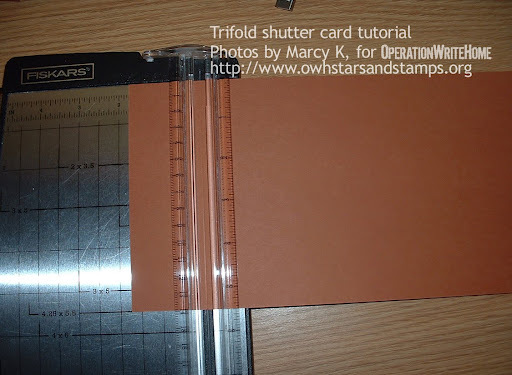 To create the card base you will need a 5 ½ x 8 ½ piece of cardstock. For my card base I’m using Handsome Hunter. 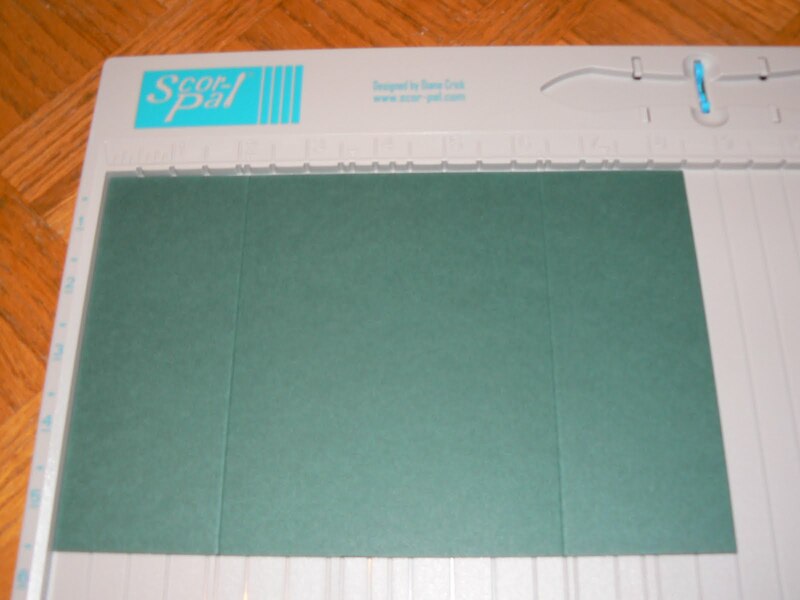 First you are going to scor the cardstock at 2 1/8”. At this point your cardstock should have two scored lines and look like this. Next fold the cardstock along the scored lines folding both ends inward. 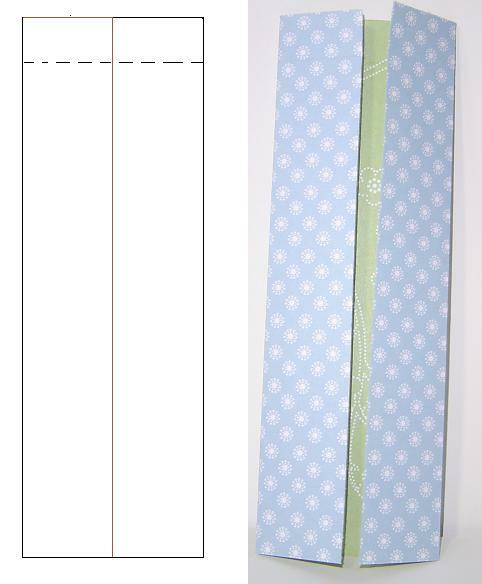 Choose some patterned paper that coordinates with your card base and cut two strips measuring 1 7/8” x 5 ¼”. Layer one strip on each of the flaps like so. Choose an image for your card. 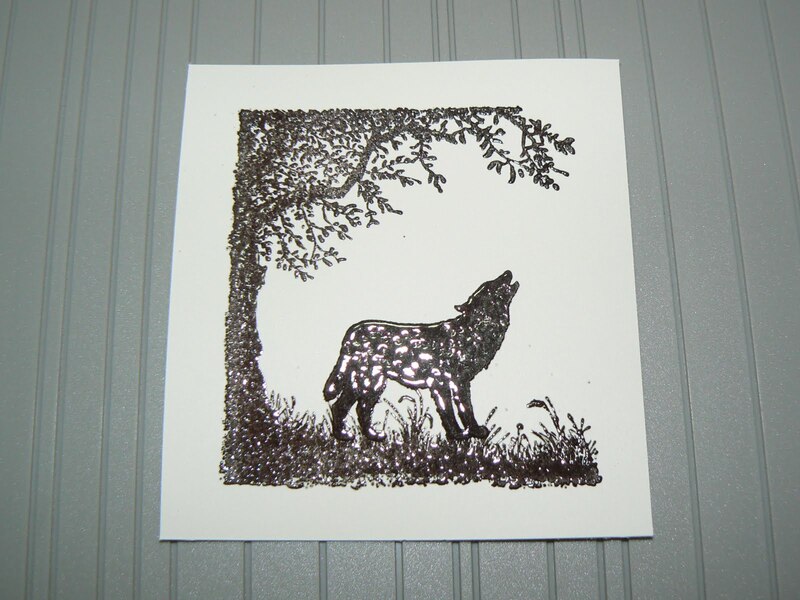 I’m going with a masculine theme so I went with the Nature Silhouettes stamp set and embossed it on Very Vanilla cardstock. Now all that’s left to do is add the image to your card base and embellish galore. Below is my finished Gate Fold Card. 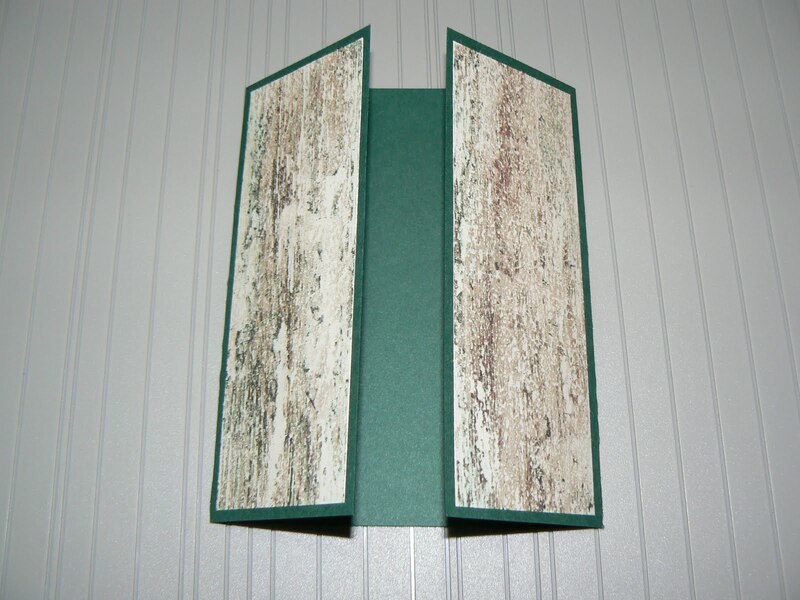 I added a 2 1/4” strip of Chocolate Chip cardstock on each flap then lined the top edge of the image with twill tape. To embellish the card I added small chipboard photo corners in each corner of the card base and some medium pearls along the bottom. 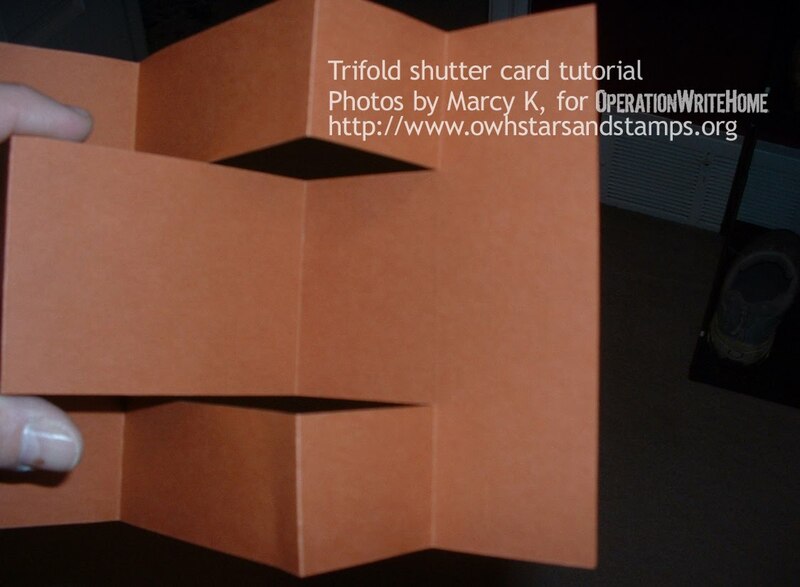 In this next photo I left the flaps go so you could see how the card looks when opening it up. 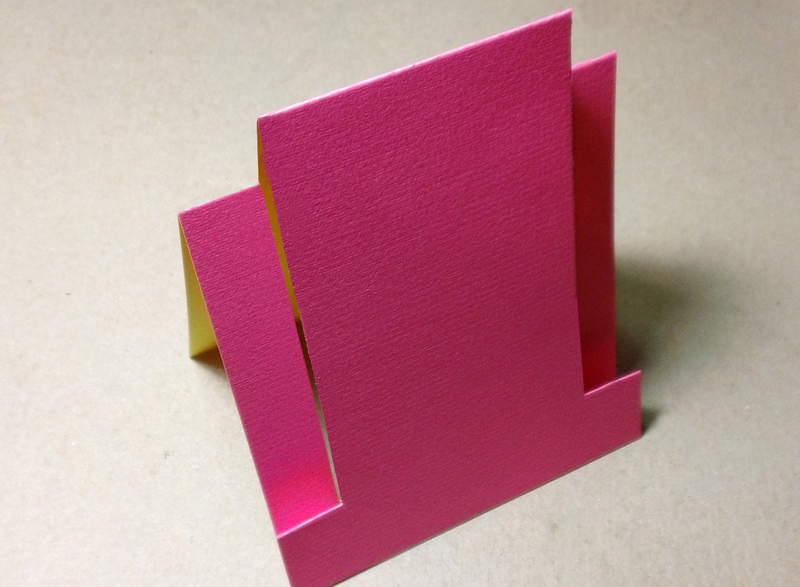 The Gate Fold Card is a simple variation of an A2 sized card but super fun to work with! It is definitely one I’ll be using time and time again! 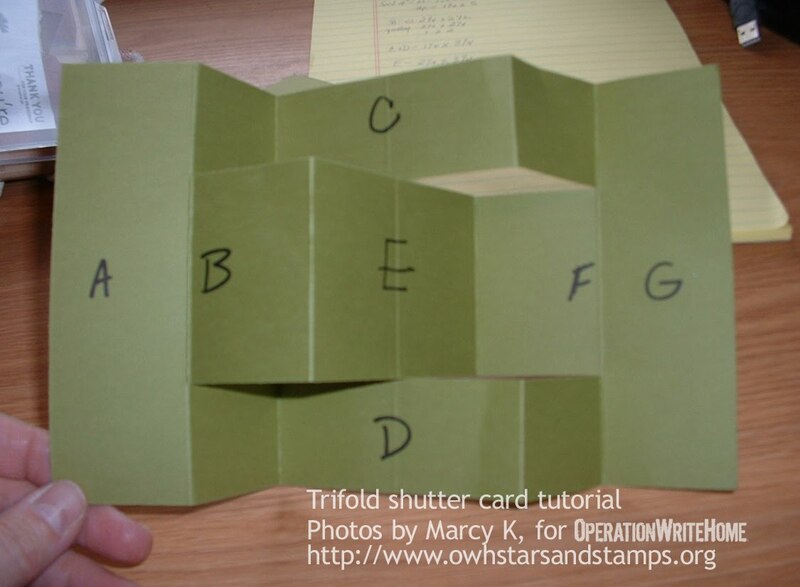 If you have a fancy fold card idea you’d like to share with all of us, please send us an email with the instructions and photos or a link to where you found the instructions and we will work on putting together a tutorial! Many thanks to Kate for this great Dahlia-folding Tutorial! Be sure to follow her blog, Hello From Kate! When I think of Mother’s day cards, I think of flowers, so now is the perfect time to make flowers using the dahlia fold. These flowers always impress, and they are much easier to make than they look. 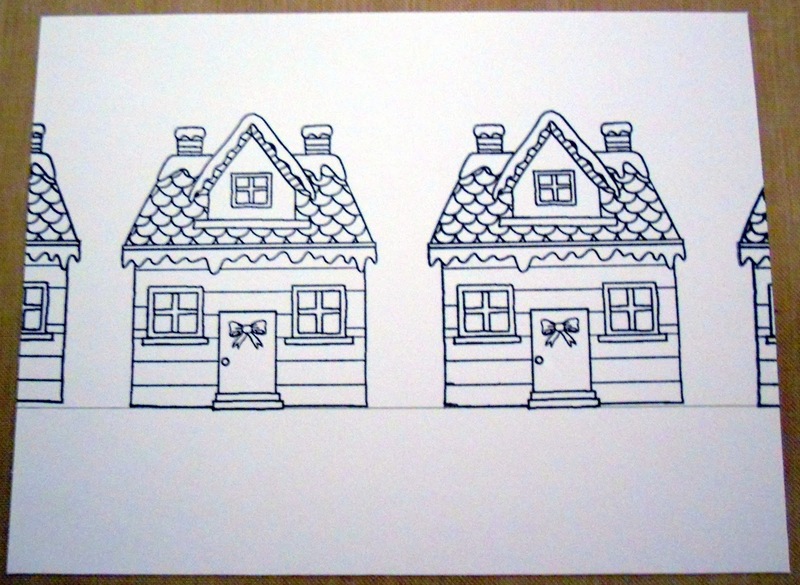 Double-sided paper – Pick one that has a lot of contrast between the front and the back. Both sides should fit the color scheme of your card. A circle punch. 1-3/4″ is a good size. I’ve made one with circles as small as one inch, but the smaller the circle, the bigger your fingers feel when it’s time to do the folding. 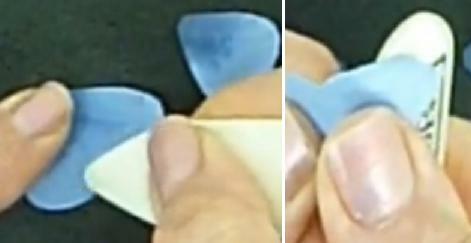 An adhesive, such as a glue stick, that allows repositioning. I made this video for the mini blog hop last summer. We were making Christmas cards at the time, but the steps are the same. If you’re not able to view the video, or if you want written instructions to have for later, here are the steps. Punch eight circles from your designer paper. These will be your petals. occasionally it will peek through between wayward petals, so keep that in mind when selecting the color. 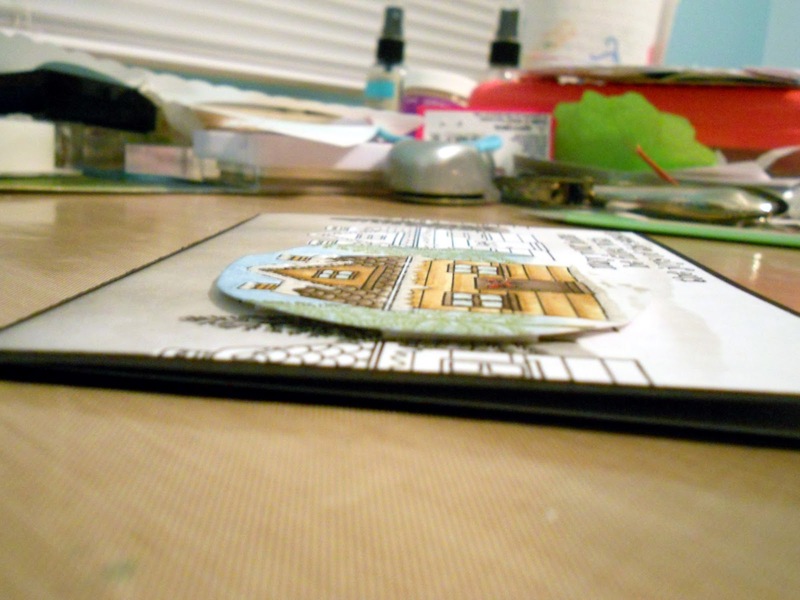 Fold the cardstock circle in half, creasing it all the way across. 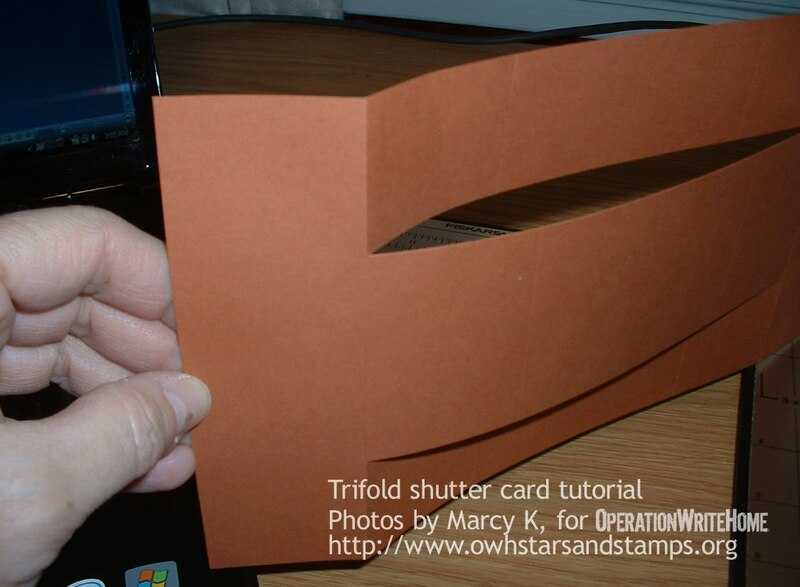 Fold it again the opposite way, creasing so that the intersection of the creases is the center of the circle. If you are going to be using a brad in the center of your flower, punch a hole in the center of the cardstock. 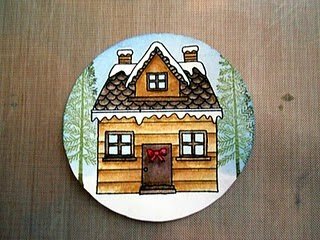 Use the gluestick to cover the entire surface of the cardstock circle. Position four of the petals along the crease lines, so the points meet in the center. Slide the remaining four petals in between the first four, to fill in the gaps. Things are going to be sticking out all wonky, and some of the petals will be stubborn from time to time. This is normal, and it will be fine. This is why we used a glue stick, so we could make adjustments. Just keep sticking the petals back in and scrunch them together until you get them the way you want them. * Decorate the center of your dahlia with a button or brad. * Fold half the petals the opposite way and alternate the petals for more color. * Use a scallop circle punch for more flourish. * Make budding flowers by sliding one or two petals inside a green petal. * Make a half-flower look like a fan, or the tail of a turkey for Thanksgiving. * What ideas do you have? 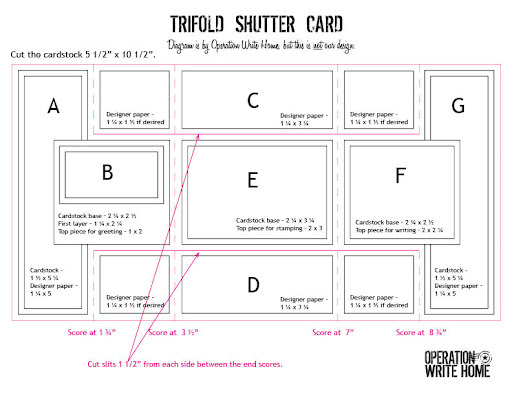 The Trifold Shutter Card is one seriously fancy card—for very special occasions! The instructions here make a card that fits into an A2 envelope (some online tutorials make a larger card); however, there is very little room for our heroes to write on a card like this. If you choose to make these, please decorate a matching cardstock insert to place into the envelope along with the card so our heroes have something to write on – if it’s decorated (a stamped or inked edge, etc), it will be clear to them that they can write a note on it, rather than just wondering why there’s a blank paper inside the envelope! Instructions starting with a standard 8 ½” by 11” piece of cardstock and, when folded, this fits in a regular A2 envelope (standard size for handmade cards). 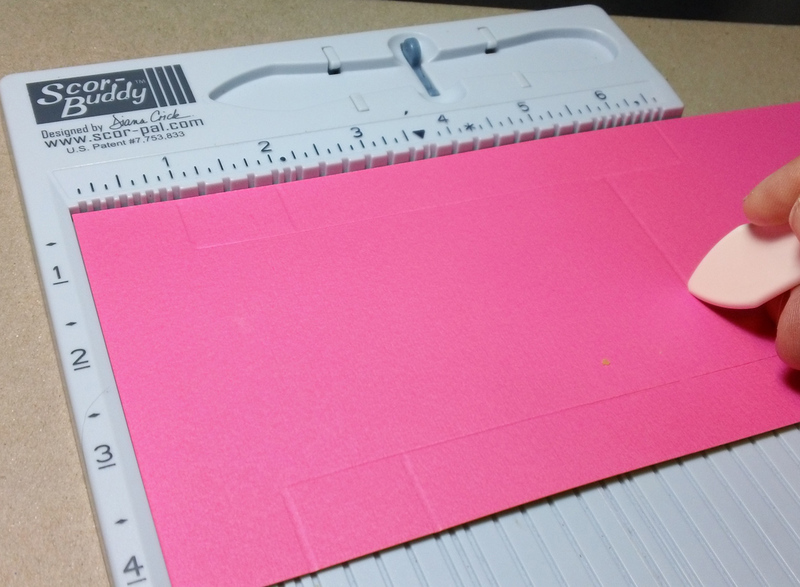 Cut the cardstock to 5 ½” by 10 ½”. Next cut a slit 1 ½” from each edge and run between the first score line and the last score line. And here’s a shot of how it looks once your slit is cut. As you can see, I was supervised the whole time I did this to make sure I got it right!! Download this diagram in pdf format. Download this diagram in jpg format. Thanks so much, Marcy — you’ve really challenged us with this one! Are you game to try this one? We’ll leave Mister Linky open for two weeks to give you time to figure out this challenging card; after that anyone’s welcome to add a link in the comments! A note for those who join us for multiple challenges; Be sure to copy the FULL url for the whole blog post to copy into Mister Linky. It automatically seems to remember the last card you entered the last time you used Mister Linky, and will link to the post with that card instead!